This is one heck of a tasty way to enjoy kohlrabi!! 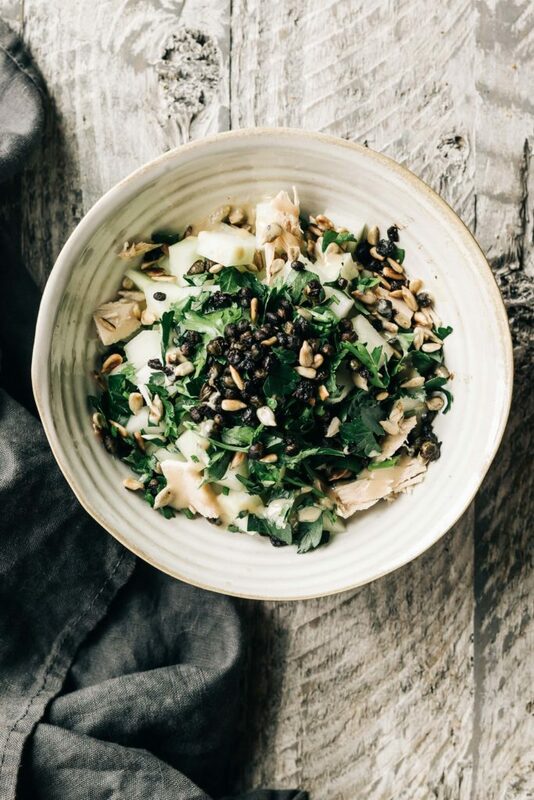 Fried capers, toasted sunflower seeds, tuna and plenty of parsley all tossed in a zesty lemon tahini dressing. Simple, delicious and filling to boot! This is my new go-to way to enjoy kohlrabi and thankfully we’ve got an abundance in the fields so I’m happy to have this on rotation for quick and healthy lunches this fall. And hey–if any of you have toyed with the idea of joining a CSA but are torn because you’re not sure about how young kids will do with the more “exotic” veggies I hope this post is inspiring. It’s been so fun to see other kiddos who are also part of the CSA light up when they see cherry tomatoes, broccoli or spinach (yes–even spinach lights them up!) You may not have control over the veggies that appear in your box each week but you can be damn sure that the contents are grown with love (and fresher than anything you can find at the grocery store!) If you’re not sure where to find a CSA in your area check out this website. And for those of you that live in the Hood River or Portland, Oregon areas we are accepting applications for our 2017 season now! Head to gotumbleweed.com for info. Anyhow, cheers to all of our awesome CSA members that have been a part of our family this year! And of course, we’ll raise a glass to the strangest looking vegetable of the bunch….Kohlrabi we love you! Prepare the dressing by whisking all the ingredients together until smooth and creamy (this works best with an immersion blender). Taste test and adjust seasonings as needed. If the dressing seems too thick, add more water to thin. Set aside. Heat a small dry skillet over medium heat. Add the sunflower seeds and toast until lightly browned, about 3 minutes. Shake the pan a few times while toasting. Pour the toasted sunflower seeds into a bowl and set aside. Return the pan to the stove and heat the olive oil over medium high heat. Once the oil is hot, add the capers and cook, stirring often, until the capers are browned and crisp and some have “popped” open. Remove from the heat and set aside. In a large bowl toss the cubed kohlrabi with the tuna and parsley. Drizzle with 1/2 of the dressing and toss well. If the salad seems like it could use more dressing add more to taste. Stir in the toasted sunflower seeds and fried capers and serve. I’ve made this recipe twice now, because who knows what the heck to do with CSA kohlrabi?? It’s an excellent recipe with the capers as the hero ingredient that really tie the dish together. Try it!